Old fashion toilets can use as much as 6 gallons per flush. We recently upgraded a toilet from a standard 2.5 Gallon per flush model to a new Toto Dual Flush model that has one button for a full flush at 1.6 Gallons (For #2) or half flush at 0.9 Gallons. 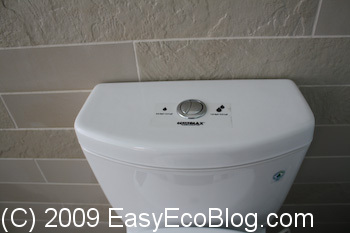 This toilet meets EPA WaterSense high efficiency toilet requirements. It has a very good flushing mechanism that works a lot better than our decade’s old toilet. If you live in select San Francisco Bay Area cities, you may be eligible for an up $150 per toilet rebate. Check with your local water district to see if they have rebates. Toilets are by far the main source of water use in the home, for nearly 30 percent of residential indoor water consumption. Over the course of your lifetime, you will likely flush the toilet nearly 140,000 times. If you replace older, existing toilets with WaterSense labeled models, you can save 4,000 gallons per year with this simpler, greener choice. A family of four that replaces its home’s older toilets with WaterSense labeled models will, on average, save more than $90 per year in reduced water utility bills, and $2,000 over the lifetime of the toilets. Some stats I saw elsewhere are even more optimistic. It really depends on how old an wasteful your toilet is. Comparing a new 1.6 Gpf (gallons per flush) vs Old 2.5 Gpf toilet – 1.2 Gallons saved per flush. Average 20 flushes a day = saving 24 gallons a day x 365 = 8760 gallons a year. This amounts to a lot of money saved a year. You can buy a new dual flush toilet for a little over $200. Toilets use a ton of water, especially older models. You can save money by purchasing a very efficient WaterSense labeled dual flush toilet with a nice big exhaust, but everyone wants to save money these days. You can put a brick in your toilet to take up space and reduce the amount of water in a flush. Alternately you can put a plastic bag filled with water or purchase a $4 Toilet Tummy to save 80 ounces of water per flush. Also prevent leaky toilets. The $5 flapper valve should be replaced every 3-5 years. There are combination dual flush toilets with a built-in sink for even more versatility. This is great for small spaces. This model is from Caroma and after flushing, cold water comes out, you wash your hands, and greywater drains into the tank for the next flush. Dual flush 1.28/0.8 gallons per flush. Sink Positive also makes one. Both are touch free, making them even more hygienic. If you cannot afford a new toilet, put a water filled bottle in your toilet tank. It will lessen your water usage.